If Star Wars has taught us anything, it’s that people in space love drinking. Luke’s trip to the Mos Eisley Cantina in the original film is one of the franchise’s most iconic scenes. And then, since there was a cantina in A New Hope, there was also one in The Force Awakens. Plus, I’m pretty sure Jabba the Hutt was hammered the entire time. But if you’re looking to do some Star Wars-themed drinking on planet Earth, stop pouring Busch Light into the Burger King Star Wars glasses you brought back from your parent’s house after your mom said she was going to throw them out. There’s a better way! ThinkGeek has recently opened up preorders for Star Wars Geeki Tikis – which are exactly what they sound like: ceramic tiki mugs in Star Wars shapes. 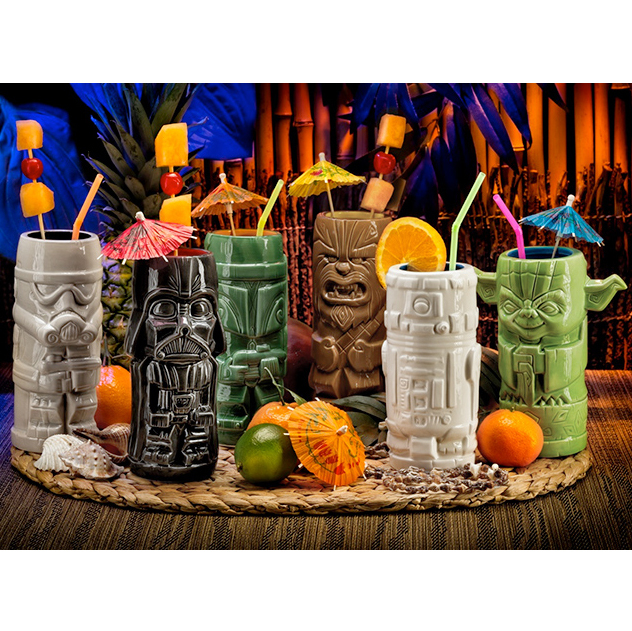 When they are released in late July, you’ll be able to enjoy a piña colada out of R2-D2, Yoda, Chewie, Darth Vader, Boba Fett or some random Stormtrooper. The designs are actually about as much of a spot on mashup of Star Wars and tiki as you could hope for. The approximately 14 ounce mugs are priced at $14.99 each or $72.99 for the entire set. Granted, that’s not cheap, but this is Star Wars: They practically invented the notion of overpriced merchandising. Have some respect for the OG of convincing you to fill your house with officially licensed crap. If there’s any bad news – outside of the fact that by late July, summer is already halfway over – it’s that according to the listing, these tiki mugs aren’t dishwasher safe. I guess it’s time to finally master washing your glassware with The Force.